During our 4 weeks test phase in the Ötztal the supposedly best skis on the market have a hard time defending their good reputation under the most challenging conditions. But also our experienced testers have to face 4 weeks of tough test runs - in any weather! But especially if the latter is friendly, testing skis in the Ötzal does not at last mean to have great fun on perfectly groomed slopes. Anyway, being surrounded by the overwhelming mountain scenery finally makes up for the less pleasant test runs. Ötztal - The Peak of tirol. Nature provides the Ötztal with snow guarantee, its inhabitants created a true holiday paradise. Among countless other Alpine valleys the Ötztal is the one with the biggest nuber of highlights. More than 70 ski lifts, over 300 km of slopes, beyond 3.000 m of sea level. 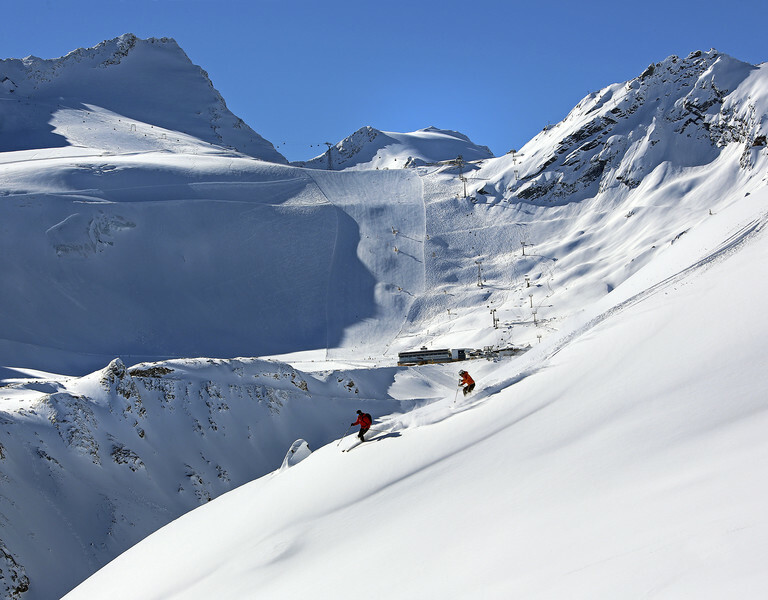 110 km of slopes, 24 top modern ski lifts, snow guarantee from November through May. Here skiing fun starts wherer it already ends in other ski areas. One of the few Alpine winter sports resorts where snow is absolutely guaranteed, Top Quality Skiing included: no lift lindes and doorstep skiing are just normal - from mid November to early May. Plus high-altitude Nordic tracks, guided ski mountaineering, winter walks, horse-carriage tours, funny toboggan rides and snowshoe hikes by night. 150 km of slopes, 3.000 m above sea level, 34 ski lifts, absolute snow guarantee plus glacier exploration. Unlimited snow sports. Fun and entertainment to the fore. Pulsating après ski and nightlife. Plus snow guarantee. That's why winter already starts in October with the traditional Alpine Ski World Cup Opening. Only one of countless internationally renowned events. And one reason more why Sölden ranks among the European cream of snow and winter sports resorts. A real Hot Spot in the Alps.